This weekend the student community can get themselves some great information for their career ahead. Aspirants leaving the Edupro are bound to have their heads a bit higher and have the glow of awareness reflected in their eyes as they leave the venue of Millennium Garden, Belgaum. 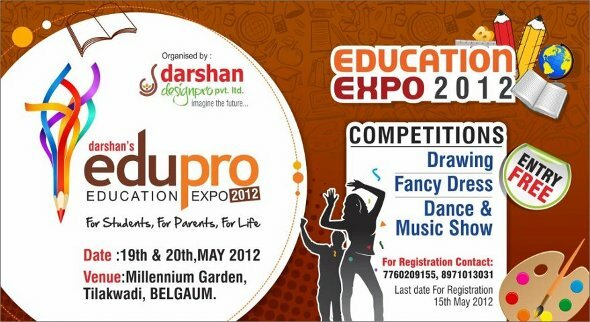 Darshan’s edupro Education Expo will bring together the world of education under one roof, showcasing over 80 exhibitors encompassing all aspects of education and support services. The Expo will create a unique platform for students from across the North Karnataka, South Maharashtra & Goa to explore the range of educational opportunities available to them. The entry to the expo is Free. Along with stalls from various schools, colleges, training institutes drawing, fancy dress competitions have also being arranged to encourage the youth. A Dance and music show will add some glamor to the entire event where again the talent of Belgaum will be showcased. To be held on 19th may 2012. To be held on 20th may 2012. About the organizers: Darshan Group are a Comprehensive Branding / Advertising / Web / Event Management Solution Company and Systems Integrator dedicated to leveraging advanced technology to solve today’s more complex business challenges.